Note: I done goofed, counting two people with the same name as one person. That means everyone who was originally #250 or greater should add one to the previous ranking. As I was compiling last week’s post visualizing Jeopardy! streaks since Ken Jennings, I noticed the number of solo champs in that timeframe was very close to 1,000. Of course, I had to investigate. What if John Schultz, the reigning champ at the time, were #1,000? Sometimes I feel like I’m toying with the integrity of the Jeopardy!-space continuum. I figured the count, once I included single-game co-champs, would probably already be well over 1,000. 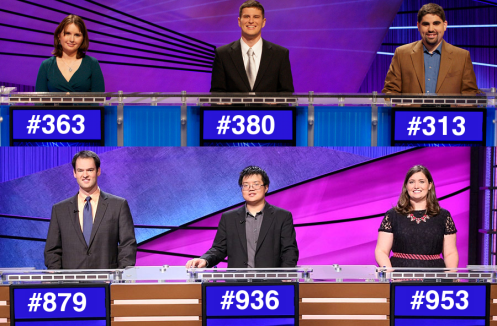 I was correct; when Nicholas Bérubé won on Friday, he became the 1,021st person since Ken Jennings to claim the mantle of Jeopardy! champion in regular play. Just for kicks, here’s the full list. I’ll be back next week with some real statistics; this was just too fun to pass up. Originally, I had Hillary Huttenhower as the 1,000th post-KJ champion. However, I didn’t notice that there were two different champions named William Lee, and I combined them. Thanks to Robert K S for building a query to check my work using J! Archive ID numbers instead of whatever I did in Excel. Sorry, Keith, your calculations aren’t correct. #1000 is Caitlin Malcuit, not Hillary Huttonhower, probably because your system thought the second William Lee was the same champ as the first William Lee who beat Michael Falk (who, by the way, was only a 2xer, not a 4xer). Also, Bob Mesko is officially considered a 5xer, not a 6xer, because he wasn’t awarded a win for his game 4-A. See link in my sig for a script that counts from an arbitrary player ID. Any plans to update this list?